It is only preseason hockey. The score has no impact on on the standings. Linemates and opposition can vary anywhere between junior to NHL calibre. Some players are fighting for jobs or to make an impression, while others are just trying to get their legs and timing ready for the show. The huge difference in potential environments makes any analysis from numbers needing more than just a grain of salt. However, the numbers are not meaningless either, so let’s take a look at the shot metrics for the Winnipeg Jets preseason players. Despite the small sample, we still see a basic trend with players with larger samples being the better players. This is a positive sign for both the Jets’ squad and management’s process. The Jets’ performance in their first two games was almost embarrassing. This is why we find most of the early cuts with such low control over the percentage of shot attempts. We can use relative numbers to slightly diminish the impact on the skaters playing different games. Relative Corsi looks at a team’s control of shot attempts with the skater on the ice versus on the bench. 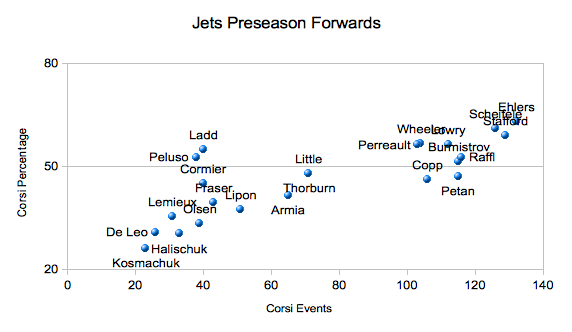 The line flattens, but we still find the Jets mostly took the best players in Corsi performance. 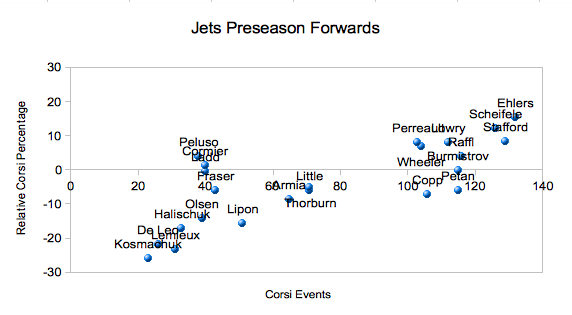 Again, Corsi is imperfect -just like any number or eyetest- especially at this small sample, but the Jets top player performance is a positive sign. The only players with negative numbers really are Bryan Little -who historically is a plus player- and those fighting for the Jets fourth line. The two Nicks, Nic Petan and Nikolaj Ehlers, were highlights of the preseason. Interestingly, Ehlers also produced the best underlying numbers over the entire roster. Like the forwards, we see an upward trend although not as steep. 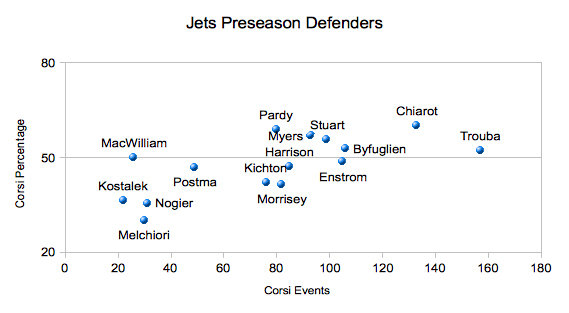 The Jets cut Jan Kostalek, Nelson Nogier, and Julian Melchiori quite early and we can see why when looking at the numbers. Again, relative numbers flattens out the trend a bit due to the Jets poor performance in their early games. 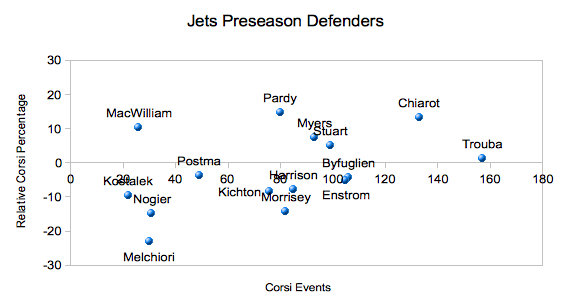 Ben Chiarot was the Jets leading goal scorer over the preseason and also had a significantly solid run in the shot metrics. It is fun to note that Chiarot has never scored more than eight goals a season at any level since his rookie junior league, yet he scored 3 here in the preseason. Both Tobias Enstrom and Dustin Byfuglien posted uncharacteristically negative numbers. Their history suggests this to be just a blip but it will be something to keep an eye on with the Jets aging veterans. That was supposed to be an eight. Will fix.